This Toyota truck has a lot of history behind it. Dyna was first released in 1956. It was not called "Dyna" at the time, but in order to differentiate between the bonnet type and the cab over type, the cab over type was given the name "Dyna". At the time the Dyna was released, Isuzu's Elf was the number one in sales by a long shot. Dyna remained in second place for a long time, but succeeded in taking first place following a model change. It has since continued to be modified in various ways in line with the times, and even now is still used in many companies. The name "Dyna" comes from "dynamic". The "Toyopet Route Truck RK52" was released by Toyota in May 1956. 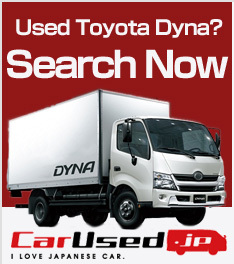 The RK85 was announced in 1959, but after nicknames were solicited from Toyota workers and sales staff, the truck's name was changed to "Dyna". In April 1963 the second generation Dyna was released. 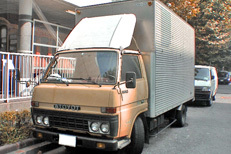 It was originally designed to only have a gasoline engine, but to compete with the diesel engine outfitted Isuzu Elf, the Dyna was also given a diesel engine which made it into a big hit.